300 beneficiaries targeted for the project, 120 beneficiaries achieved so far forming 8 SILC groups saving. $12.20 saved as average savings from the 715 (576 females& 139 males) beneficiaries with a total of $8754 savings. 200 beneficiaries trained on Climate Change, Conservational Agriculture and Hygienic practices, beneficiaries assisted in developing tippy taps for washing hands to promote hygiene. 200 beneficiaries have also been trained on animal husbandry. 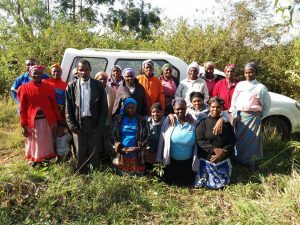 Lutsango Phalala Seed Producers is a group of 23 SILC beneficiaries who own a garden project and yields grain sugar beans. The group established the project in 2010. The project was triggered by the poor quality of bean seeds that was imported from overseas and became spoiled whilst in transit especially through sea transportation. This group was permitted by their chief to use an old farm as way of community development. These women were inspired to have this agricultural livelihood to sustain their self-resilience and well-being by dedicating their time and effort to work towards their goals. They sell their produce to agricultural suppliers i.e (Khuba Traders). This year they were able to harvest four (4) tonnes of sugar beans (grain) on their 12 hectares of land. These women are able to save money and accumulate their financial assets through SILC and finance their project. SILC has been the cornerstone for this project for members to make financial contributions for farm inputs. On another note, these visionary women have a dream to expand their produce and to supply other agricultural produce like vegetables and maize throughout seasons. The SILC project coordinate has committed to assist the group fulfil their dreams by providing technical support on fundraising for the project’s irrigation system and fencing. Through a two day workshop dated (11/06/2018 and 12/06/2018) we were able to conduct a vulnerability assessment and observe the existing assets of the group to enable the proposal writing.